Hi all. During the AE sale over Labor Day weekend I started a thread asking for input on AE's newish sneakers. The responses were mixed. 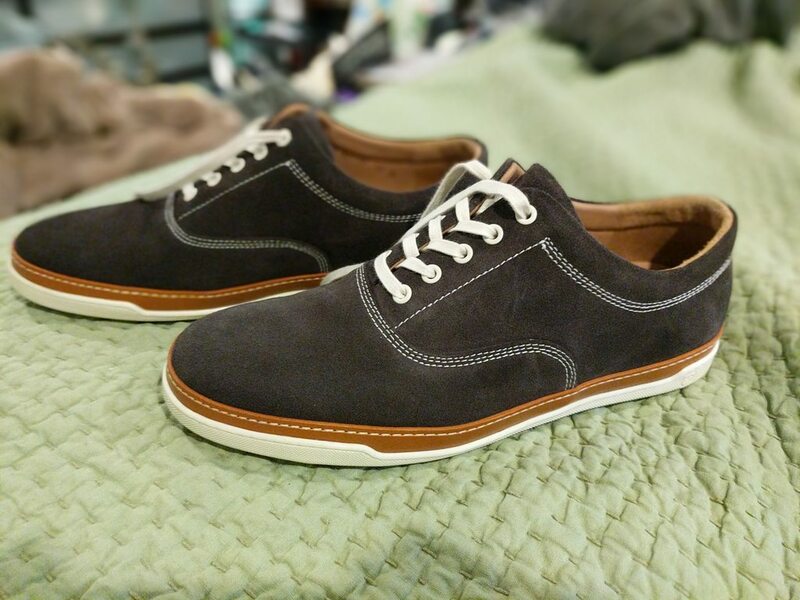 I pulled the trigger on a pair of Porter suede sneakers, though apprehensively. $112 for a pair of sneakers seems steep, but I figured I could return them if I didn't like them when they showed up. After more than a week of "processing your order" and shipping, they arrived yesterday. I ordered a size 12D which seems to fit well. I tend toward a 12E in AEs. 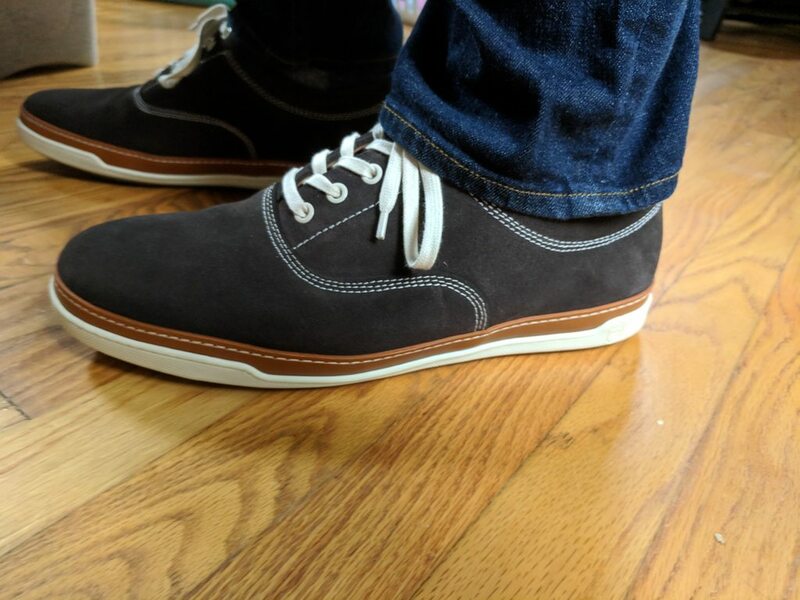 This shoe doesn't come in wide sizes, instead it comes with a removable insole which, when removed, supposedly provides the added room for a wide foot. I did not need to remove the insoles. The shoes are very comfortable, and with the insoles, very plush feeling. The suede is of good quality, though not as soft as the suede on my AE Strandmoks. Overall construction quality seems to be very good. These feel substantial - not flimsy at all. The contrast stitching visible on the exterior (such as the triple row stitch around the vamp, and the single row of stitching around what I'll call the welt) goes all the way though to the interior - it is structural, not just aesthetic. The sole is rubber and appears to offer good traction and be well constructed. 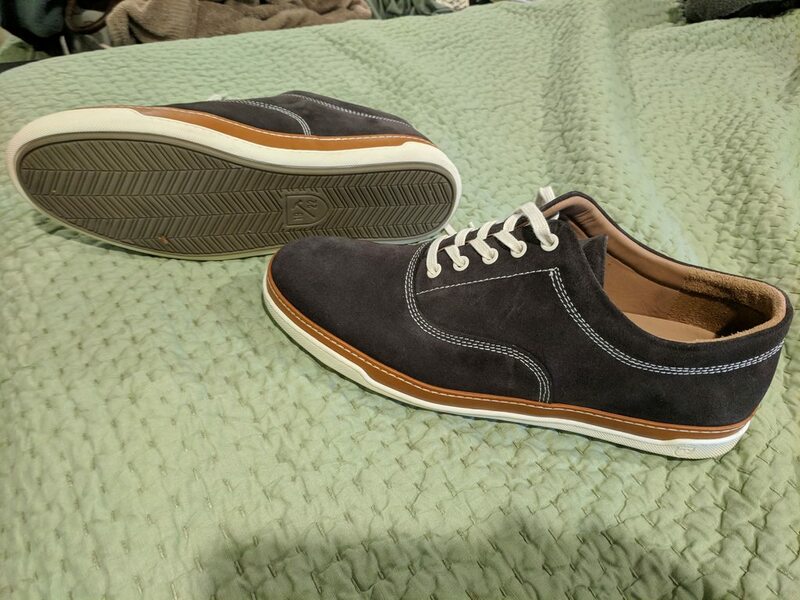 Having owned sneakers in the past from Superga, Converse, Sebago, Sperry and others, I can confidently say that this pair from Allen Edmonds appears to be the highest quality of the lot - as it should be given the price-point. The slightly off-white sole, white laces, and white contrast stitching make make these casual enough for wear with shorts, while the deep color of the suede and tan leather welt allow them to look good with jeans as part of a casual ensemble. These sneakers are fully lined, which makes them warmer to wear and probably less suited to hot weather use. 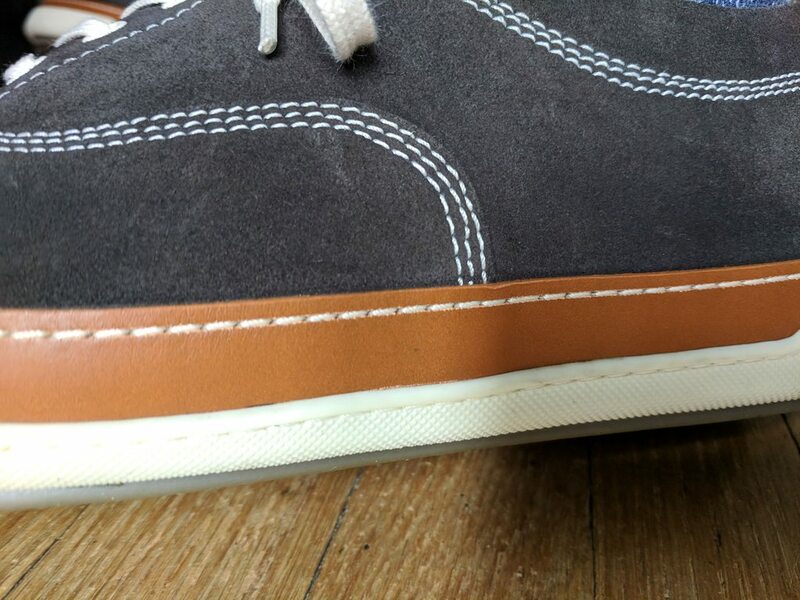 The lining appears to be primarily smooth leather (thought admittedly it may be a faux, I cannot find confirmation of the exact material), with the exception of the heel area which is lined in suede (presumably to combat heel-slip). The aesthetic may not be for everyone. I personally like the look of the rather wide, tan, leather welt, but others may not. At the sale price of $112, I believe these are a good value. However I would be hard-pressed to justify purchasing at the regular sale price (sans 40% off Labor Day code) of $187, much less the full retail of $225. Being sneakers, these are cemented, built overseas, and not recraftable. Lastly, the only truly negative thing I have to say about them - when I unboxed them I was not met with the scent of leather, but rather the chemical smell of rubber cement. This has dissipated now though. Overall, I'm pleased with this purchase and would recommend AE's foray into sneakers based on this experience so far. I hope that the appearance of initial quality holds up to time and usage. Last edited by Mr. Charles; September 14th, 2018 at 01:09 PM. Thanks for putting this together. Always good to get more informative reviews here, even if it's not something I'd consider of interest to me personally. They look better in these pics than they do on the AE site. Great review. Those look sharp, much better than the website. I definitely think those are good at the $112 price-point. Thanks for your kind remarks @Flunky, @Hebrew Barrister and @Shade. I know we're all apprehensive about the "new" AE. My hope was to shed some light on one of the products from this new incarnation of a company that used to be favored by many of us. I like 'em. Glad to hear you do too. Nice shoes and nice review.